Donald Trump appears ready to raise US import tariffs and reshape the global trading system. We argue that tariff scares – that is, increases in the likelihood of any form of import restraint – reduce international trade. With Trump's threats to hike tariffs, damage to US trade, to US businesses dependent on trade, and to US consumers' purchasing power may have already begun. Recent contributions (Handley 2014, Handley and Limao 2015, 2016, Limao and Maggi 2015, Pierce and Schott 2016) have shown that uncertainty over future trade policy has a real effect on international trade. Two important papers (Handley and Limao 2016, Pierce and Schott 2016) have looked at China's accession to the WTO. This event was characterised by little or no change in the level of US import tariffs on goods from China, but involved a substantial reduction in uncertainty about what the US tariff rate on Chinese goods would be in the future. Both studies use the elimination of pre-existing cross-sectional variation in tariff uncertainty that came with China's accession to identify the impact on important variables. Handley and Limao (2016) find that this reduction in trade policy uncertainty can explain 22-30% of China's subsequent export growth to the US, while Pierce and Schott (2016) document how the reduction in trade policy uncertainty facing Chinese exporters contributed to the sharp drop in US manufacturing employment. In a new paper, we provide the first empirical evidence that tariff scares – threats to raise tariffs in the future – have negative impacts on trade even when the threatened import tariff hikes never actually materialise (Crowley et al. 2016). Our analysis uses the universe of transaction-level Chinese customs data and focuses on the foreign market entry decisions of Chinese firms in response to antidumping duties, a type of special import tariff permitted under the WTO’s contingency provisions and imposed against China by 17 economies over 2000-2009.1 The interesting twist is that we study not how Chinese exports to a country fall when that country imposes a tariff, but rather how entry into new foreign markets by Chinese firms declines when other countries impose these special tariffs. Our analysis is based on the phenomenon of ‘tariff echoing’ – after a tariff hike in one country, another country is likely to raise its tariff on the same product (Tabakis and Zanardi 2016). We examine the global use of antidumping duties because their use in restricting product-level imports is correlated across countries at short time horizons. Tabakis and Zanardi (2016) calculate that the probability of a new antidumping duty for an origin-destination-product triplet among 15 destination countries and 39 origin countries from 1980-2005 is a mere 0.024%. Importantly for our purposes, they also document that the probability of a new antidumping duty in any of 14 destination markets in a given year conditional on a new antidumping duty in a first market in the previous year jumps to 0.721%. Tariff hikes under antidumping policy occur rarely, but if one importing country hikes its tariff, there is an increased probability of a future tariff hike on the same product in other markets around the world. entry into other foreign markets with the targeted product by other Chinese firms that did not face the tariff hike in the first destination country because they did not export the product in question to the country that raised the tariff. In case (3) above, we investigate if information about likely future tariff increases spreads from firms that have been hit with new foreign duties to firms that export the same product to other destinations. We exploit firms' geographic locations within China to estimate how news about one country's antidumping duty can influence the export behaviour of firms not directly affected by the foreign policy change. We construct product-level trade policy information shocks for all Chinese prefectures, and find that firms exposed to a more intense trade policy information shock are far less likely to enter new markets. This finding suggests a benefit accruing to exporting firms located in industrial clusters – they acquire valuable information about foreign market conditions. We estimate the responses of Chinese manufacturing firms and trading firms separately and use our estimated models to quantify the number of missing firm-product-destination entrants over 2001-2009. Our model implies these missing entrants never materialised because they were discouraged from entering by the threat of antidumping duties (Figure 1). Over 2001-2009, the average number of missing entrants per year is 1,718. 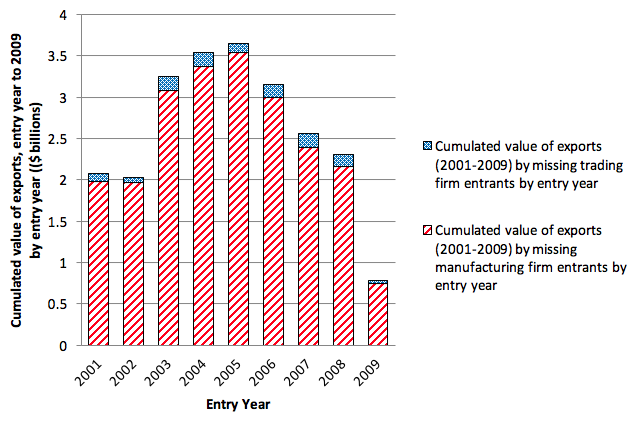 The average number of missing manufacturing firms is 1,399 while that for trading firms is 319. The total number of missing entrants grew from 670 in 2001 to a peak of 2,920 in 2008. 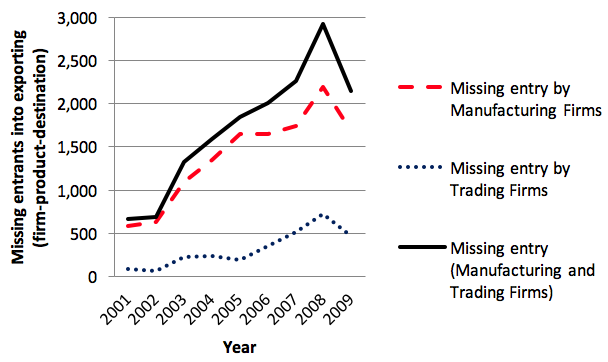 In Figure 2, we construct counterfactual estimates of the accumulated missing value of trade associated with missing entrants in each year, 2001-2009, under the assumptions that each missing entrant never enters and would have exported the mean value of trade in subsequent years if it had entered. The red hatched bar and the blue speckled area for 2001 indicate that if there had been no uncertainty about trade policy around the world, the 670 missing entrants from Figure 1 (above) would have exported approximately $2.1 billion over 2001-2009. We conservatively estimate the total value of missing trade from China over 2001-2009 associated with the uncertainty created by some countries' use of antidumping policy at $23.3 billion. Finally, we use these models to counterfactually estimate the share of new firm-product entry from China over 2001-2009 that was due to the elimination of trade policy uncertainty that came with China's accession to the WTO. If we assume that the trade policy uncertainty a country faces when it does not belong to a trade agreement is of the same magnitude as the trade policy uncertainty it faces under the WTO's contingency provisions, and that increases and decreases in trade policy uncertainty have symmetric effects on entry, then we can use our model to estimate how much entry by Chinese firms was created by the reduction in trade policy uncertainty that came with China's WTO accession. Of the actual 116,945 firm-product-destination entrants per year in our sample over 2001-2009, we estimate that 42,163 per year were due to the reduced uncertainty over trade policy caused by China's entry into the WTO. This represents 36% of new entrants per year. New entrants are typically smaller in terms of their total export value than more established exporters, but they contribute substantially to overall export growth. Returning to the question of the US’ trade policy under the new Trump administration, our analysis suggests that the risk of rising trade barriers is likely already discouraging potential exporters around the world from attempting to enter the US market. It appears that the era in which low levels of uncertainty about future trade policy were an important force behind trade growth may now be coming to an end. Crowley, M, H Song, and N Meng (2016), "Tariff Scares: Trade policy uncertainty and foreign market entry by Chinese firms," CEPR Discussion Paper no. 11722. Handley, K (2014), "Exporting under trade policy uncertainty: Theory and evidence," Journal of International Economics, 94 (1): 50-66. Handley, K, and N Limao (2016), "Policy uncertainty, trade and welfare: Theory and evidence for China and the U.S." NBER Working Paper no. 19376. Handley, K, and N Limao (2015), "Trade and investment under policy uncertainty: Theory and firm evidence," American Economic Journal: Economic Policy, 7(4): 189-222. Limao, N, and G Maggi (2015), "Uncertainty and trade agreements," American Economic Journal: Microeconomics, 7(4): 1-42. Pierce, J R, and P K Schott (2016), "The surprisingly swift decline of US manufacturing employment," The American Economic Review, 106 (7): 1632-1662. Tabakis, C, and M Zanardi (2016), "Antidumping Echoing," Economic Inquiry. In this analysis, the countries of the EU are treated as a single entity as the EU’s member countries share a common trade and antidumping policy. If some firms not hit by a tariff update their beliefs, then our estimate on the measure of trade policy uncertainty will be biased toward zero.